Thule Urban Glide 2 2018 is a serious competition for the beloved BOB Revolution Flex/Pro which is the God of joggers. Both have a lot of amazing features and are very close in price. The Thule Urban Glide 2 2018 is a mean machine designed for active parents who value performance and durability. It rolls on large air-filled tires that together with rear-wheel suspension provide a smooth ride and a great maneuverability. The Glide 2 2018 offers plenty of storage including roomy basket with a cover, two mesh seat pockets, small zipper pocket on the back of the basket, and large pocket on the back of the seat. For 2018 Glide 2 got bunch of great updated that made it even better! The canopy is now even bigger with an added zipped-in mesh panel that provides better air flow. A new hand brake on the handle bar allows parents to slow down or quickly stop the stroller. The new auto lock makes it much easier to secure a folded stroller. To help stroller stand out in the dark, they’ve added new reflective features to the canopy and the wheels. I was happy to see a bumper bar as an added accessory that you can purchase separately. All these great updates have increased the weight of the stroller from 23 lbs to 25.3 lbs, but the Glide is still one of the lightest joggers on the market. It glides over rough terrain and because of such a light weight can be pushed with one finger. It definitely wins in the weight category over BOB Flex at 28 lbs and BOB Pro at 30 lbs (heavy!). Just like on BOB the handle bar is adjustable, but with fewer positions. Aside from the lighter weight, another place where Thule wins is the one-hand fold with a standing fold. Very easy and quick! At this point you are probably wondering if Thule is so great why would anybody buy BOB? Well, BOB has all-wheel state-of-the-art adjustable suspension system that is hard to bit. While I do like Glide’s rear suspension system, BOB has a little smoother ride. Also, the tracking on BOB is more consistent and has less dragging. Overall, BOB is just more balanced jogger. The seat padding on BOB is thicker. The seat is more upright in the most upright position. There are much more accessories available for purchase. Something to think about. Of course I gave Glide 2 2018 5 out of 5 stars. It’s a fabulous jogger with so many great features. The light weight and one-hand fold really puts it ahead of the competition. As for some of the drawbacks, they are very minor. The foot brake is a little stiff and not flip-flop-friendly. Not like all joggers have flip-flop-friendly brakes. LOL. But, it looks a little outdated. I would like so see an included air pump since with air-filled tires you will have to buy one anyways. There is also no cup holder included nor a bumper bar, but you could purchase those separately. The Glide 2 2018 is available in four different colors and retails for around $449. No accessories are included. The double version is also available for around $679. -Amazing canopy. A good sun coverage is super important when jogging. This large UPF 50+ canopy has two large panels, plus a pop-out sunvisor that you can tuck away when not needed. For 2018 there is also a zipped-in mesh panel that extends the canopy and provides better air circulation. There is a large plastic peekaboo window at the top with MAGNETIC closure (no noise Velcro) so you can spy on your little one. Overall it’s a great canopy that provides plenty of sun shade. -Adjustable handle bar. The handle bar goes from 39″ up to 45″ from the ground. Perfect for shorter and taller parents. The handle bar is covered with foam which I have love/hate relationship with. On one hand I love that it’s so comfy to the touch, but on the other hand it’s harder to clean than rubber and it also absorbs the sweat. If you sweat a lot, it might get yucky after a while. -Hand brake. For 2018 they’ve added a twist hand brake that can be used to slow down or stop the stroller. -Run-away strap. There is a run-away strap attached to the handle bar. It will prevent your stroller from running away from you in case you let go of the handle bar. But, I wish it was attached to the bottom of the stroller instead, because when it’s attached to handle bar if you fall, the stroller will fall right with you. -Roomy seat. The seat is 15″ wide with 21″ seat back and a measurement of 25″ from the bottom of the seat to the top of the canopy. This is a great seat width and canopy height. Your older child should fit just fine. One thing is worth mentioning is once you recline the seat you will see a large mesh window in the back that might prevent your older child from tacking a nap. I think this is not a big deal since older kids (like 5-6) are unlikely to nap in the stroller if they nap at all. For most of us those sweet days are over by 4 years. The seat is slightly reclined even in the most upright position. As you know, I like very upright seats because I think it’s more comfortable for little babies who like to sit up straight. Talking about recline, it has one-hand strap recline that is pretty deep, but not completely flat. You will need BOTH hands to bring the seat back up. The seat can accommodate a child from 6 months and up to 75 lbs (like 10 year old). If you want to use it from birth, you can convert it into travel system with most popular car seats. -Mesh back window. Once you recline the seat, you will see a large dark mesh window in the back that provides good air circulation while still protecting from the sun. It also prevents your baby from sliding out of the seat. The closure for the window now has a magnetic closure instead of noisy Velcro that they had before. -Parent storage pocket. There is large mesh storage pocket in the back of the seat for parents. -Seat pockets. There are two mesh pockets inside of the seat where kids can store their snacks. -Large basket. The basket not only big, but also has a zipper/velcro cover which prevents stuff from falling out while you are running. If you don’t need it, you can simply roll the cover away. There is also a small zipper pocket in the back of the basket for small essentials. -Brake. There is a one-step break in the back that locks both of the rear wheels. This brake is a little stiff and outdated in my opinion. It’s also not flip-flop-friendly. -Large wheels. It rolls on three air-filled tires with 12″ tire in the front and 16″ in the back. Of courses you will need to get an air-pump to maintain the air-filled tires. If you get a flat (happens once to everybody who owns a jogger), you can just take it to your local bike shop and they should be able to fix it with no problems. No need to order special tubes. The front wheel is swivel, but can be locked straight. To lock it, you will need to bend down to the front wheel and turn a knob. There is no remote lever like you see on Baby Jogger Summit X3. The front-wheel fender helps to deflect mud splatters and dirt. The maneuverability is outstanding! It glides over terrain. -Adjustable tracking. If the front wheel is starting to pull, you can adjust it for more stable jog. -Rear suspension. Of course it has a great robust suspension system that makes the ride very smooth even when going over rough terrain. -One-hand fold. The fold is super easy! All you need to do is turn a blue handle under the foot rest and pull the stroller up so it folds. You can easily do it with one hand. For 2018 they’ve added an auto lock. The folded dimensions are 34.5″ x 21″ x 14″ (with the wheels removed). -Travel system option. It works with major car seats. 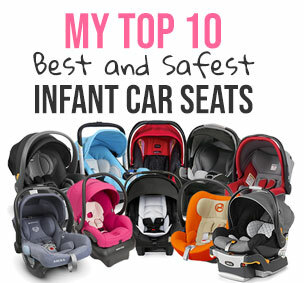 Here is my list of top 10 safest car seats on today’s market. -Stiff foot brake. It’s not flip-flop-friendly and also looks very outdated. -Reclined seat. The seat is sightly reclined even in the most upright position. I would like to see a more upright seat. I already listed all updates above, but let’s go over them one more time. -Hand brake. New hand brake has been added to the handle bar. You can also use it as a decelerator to slow down when going down the hill. -Reflective accents. They’ve added a reflective trim to the canopy and reflective rims on the wheels so your stroller will stand out in lower-light. -Auto lock. In the previous model you had to lock the stroller manually after folding it. Now there is an auto lock for that. -New canopy. The old canopy used to have ‘follow-the-sun’ option which is when you disconnect it from the seat and bring it down. Now the canopy is attached to the seat, but they’ve added an extra zipped in mesh panel that can be extended to make the canopy go down farther. The dark mesh panel also provides better air circulation. Also, the pop-out sunvisor used to be made out of mesh and now is made out of same material as the canopy. Overall the canopy got larger and more practical. -More car seat options. There used to be only one universal adapter before. Now they’ve added more tailored car seat adapters for popular brands. -Bumper bar option. They also added a new bumper bar as an accessory that you can purchase separately. -Higher weight. The weight has also increased from 23 lbs to 25.3 lbs. -Higher price. The price has also increased from $399 to $449. The Thule Urban Glide 2 2018 is available in four colors: blue, grey, black, and red. My favorite place to buy strollers and a lot of other baby items is Amazon. It usually has the lowest prices, free shipping, free returns and no sales tax. How great is that? You can get Thule Urban Glide 2 2018 in one of the four beautiful colors for around $449 on Amazon (free shipping/free returns). There can also a Thule Urban Glide 2 2018 as a double for around $679. I am not a jogger but previously bought the baby jogger summit x for my special needs 5 year old for easy mobility and a smooth ride. He is now seven and is outgrowing the stroller…his head comes close to the canopy and his knees are higher up….in short I need something a little bigger. He just turned seven but is the size of a five year old….how tall of a kid do you think this stroller will seat comfortably? This stroller is horrible. It claims to be more rugged than most tires on the market but in reality the tires go flat constantly if there is a rock, thorn or stick in the sidewalk. The tires are very cheaply made and not durable at all. I bought another stroller for 1/3 the price and it works much better with the plastic tires. Thie Thule urban glide is a complete rip off.